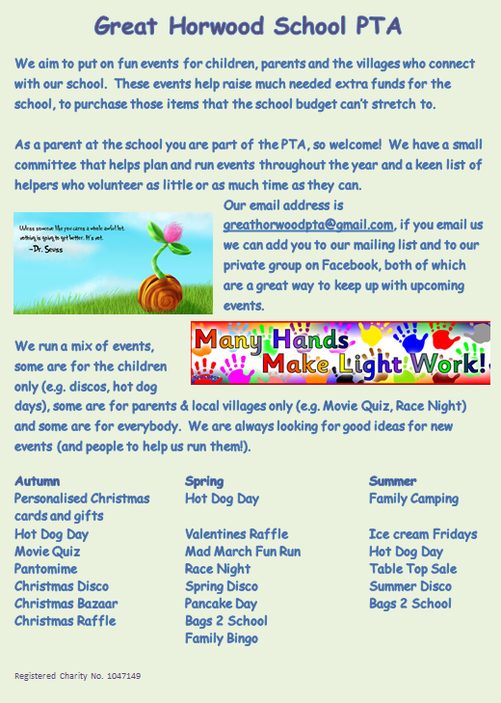 The PTA do an amazing job in raising much needed funding for the school. There has been a strong focus on outdoor learning in 2017-2018. Our new rainbow coloured picnic benches are fantastic and the children love to use them for outdoor learning and of course having picnics. The new all weather grass and new equipment has transformed the very wet and muddy Trim Trail into an area that all children will enjoy and benefit from at playtime, lunchtime and in PE. This is all down to the PTA - we couldn't have done this without YOU - the parents supporting the school and helping to provide your children with additional resources whilst having a fun time too. If you are able to give some of your time and join the PTA committee please do contact the school office and we will put you in touch with the Chair of the PTA.